Chaggai, the lovable, know-it-all dove, is back, with his friends Bina and Benny. This time they are exploring the wonders and pleasures of Shabbos, from Sinai to the Shabbos table loaded with delicious delicacies. We join them as they prepare for the great day and learn all about its do's and dont's -- and especially its joys and duties. 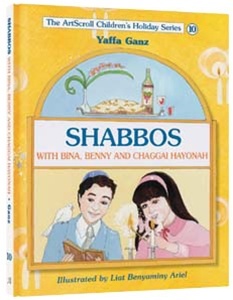 Like all the books in her Children's Holiday Series, Shabbos with Bina, Benny and the Chaggai HaYonah is and ideal child's companion all year round.